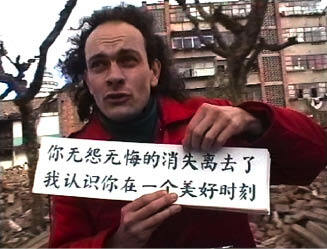 In the city of Kunming, Southchina, we observe hundreds of families moving out of their homes located in lively old town areas, which were afterwards destroyed. 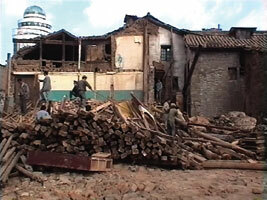 "Gold-Jade-Avenue" (Jin Bi Lu) runs through the demolition area. About its disappearance we write a new chinese text accompanied by the melody of "Xin Tai Ruan", the most popular song in these days. Driven by a tricycle along "Jin Bi Lu" for the last time, we perform our new song, accompanied by the music from a tape recorder.